During the development of the World of Mana subseries, Creator Koichi Ishii had adopted the mindset that innovation was a necessity for the Mana series to flourish. With the idea that change was the absolute force needed to drive the series forward, Ishii and his team didn’t hesitate to implement different styles or varieties of gameplay from other genres and incorporate them into their games. The overall results have been mixed, as some games recapture the brilliance of past successes while others fail to perform. Rather than returning to form with more traditional or familiar gameplay styles that have been successful and well received by his fanbase, Ishii sought an even greater departure from his roots. Heroes of Mana is the pinnacle realization of this drive for change. Heroes of Mana tells the story of a darkness that predates the existence of the Mana Goddess. As the Goddess comes into being as a deity, the source of this darkness, an ancient dark witch, becomes obsessed and jealous because she herself cannot ascend into godliness. Through an anger-fueled hatred, she swears to unleash her wrath upon everything that has a connection to Mana and the Sanctuary. One such place is the land of Fa’Diel where this story unfolds. The dark witch has manipulated several ruling members of Pedda, instigating a world war to fill the land with her darkness and drain the Mana out of it and into her realm of Mavolia. Our hero, Roget, and his crew travel across the lands to confront the Peddan army and discover the source and ultimate intentions of this creeping darkness. The story and storytelling of Heroes of Mana both demonstrate a tremendous ambition to tell a deep, impactful story, but unfortunately the execution varies in quality. In terms of storytelling, the game employs a straightforward method of delivery, similar to the 2D Fire Emblem games and it works especially well. Story segments are shown before and after every chapter and all conversations between characters occur automatically and linearly, so there is zero risk of missing anything. 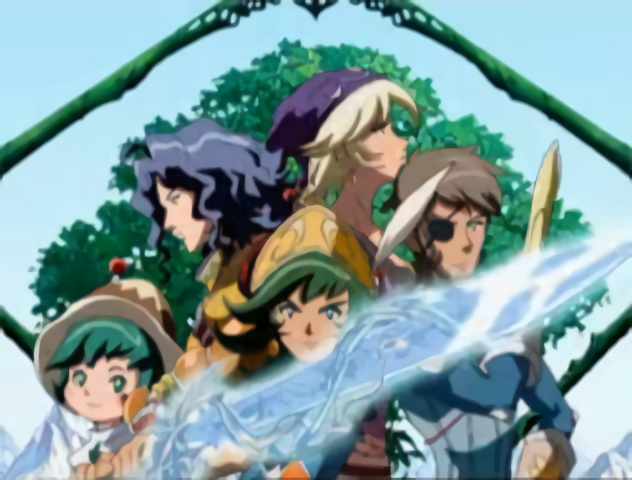 The visual style is similar to Fire Emblem, too, with static portraits of the characters on-screen during their dialogues. It’s implemented nicely and although it’s a departure from the player-controlled interactions common for this series, it doesn’t take anything away from a player’s ability to experience the story. The actual story components are what make the overall quality mixed. The main plot is actually quite impressive, as it introduces one of the most fearsome and formidable threats the series ever had. It also introduces several more complex concepts of the Mana universe, such as the confirmation of a multiverse and that these other realms or plains of existence are also influenced by both the Mana Sanctuary and Mavolia realms. I also appreciate the backstory of the Benevodons and its connections with other Mana games. Their purpose is to end the world, similar to the roles of the Sword of Mana and the Mana Beast in Secret of Mana. When evil corrupts the world and abuses Mana, there is a means to end and then reset the world. But here, the world is not yet supposed to end, nor end in this manner, so, in somewhat ironic fashion, the Benevodons help Roget and crew to save the world instead. These glimmers and tidbits, although rare, are fantastic for longtime fans of the series. Unfortunately, the most problematic aspect of the story is the sheer lack of detail. Far too many of the story elements are hastily introduced and are never extensively expanded upon. While I mentioned some of the brighter spots of the story, more detail would have brought much needed depth, as well as clarity to the more inconsistent and convoluted parts. The pacing of the story is also a major issue, as much of the initial plot is introduced in the beginning chapters of the game, yet then players suffer through a flow-breaking lull during the middle chapters. The plot only, finally, picks up again at the conclusion of the game. This sharp break in plot movement on top of the lack of details to begin (and end) with results in a story that fails to capture attention or produce any sustained immersion. This lack is even more apparent with the utter absence of character development. We are given some specifics about some of the characters, whether it’s about their personalities, relationships, or past endeavors, but it’s just haphazardly thrown our way. What’s worse, since this game takes place in the same world and a generation before Seiken Densetsu 3, there was ample opportunity to properly develop a bridge between these characters and the ones referenced from SD3. Instead, we are given the bare minimum that makes zero lasting effect. There just isn’t enough detail, or in some cases, content, to develop any genuine feelings for these characters either. Moments that should be heart-wrenching, blood-boiling, or mind-blowingly momentous instead fall completely and utterly flat. The ambition and intent are there, but the execution fails to draw players in and produce those impactful, memorable reactions. Along with the unique style of storytelling for a Mana game, Heroes of Mana features the farthest departure from its gameplay roots. Heroes is a real-time strategy game, a first for the series and the first Mana game not labeled an RPG. Gameplay consists of building houses to summon monster units, gathering Treant berries and Gaia stones to summon and build additional units and structures, and directing your summoned units for battle. Unit types consist of gatherers for gathering, special units for scouting and other non-combative tasks, and the combat units, which are ground, flying, missile, and heavy units. These last four follow a strength/weakness pattern that is explained (ad nauseam) in game. There are also leader units that possess their own special abilities. Finally, there is the mobile base, a ship called the Nightswan, wherein all the building occurs and where your summoned units deploy from. As for the controls, most actions are performed with the stylus on the lower screen. Units can be tapped and directed individually, or you can select an entire type of unit together and give them a target. You can also draw a loop around groups of mixed units and move them together. Selecting gatherer units and targeting a Treant or Gaia will display a shovel icon for gathering. Targeting enemies with combat units will display a sword icon, but if these units are near enemies, the AI will initiate combat automatically. The game is broken into chapters and most are completed upon the defeat of an enemy leader, base, or some other objective involving defense or gathering. As for its implementation, the RTS mechanics are satisfactory. I appreciate the ease of building and summoning, especially since every single chapter relies on it. I also like the ability to select entire types of units for commands, as directing individual units would be an absolute pain. Tying unit type upgrades to the acquisition of elemental spirits and Benevodons was also a simple method to improve gathering and combat abilities since there is no hunting/ capturing component to the game. Strengthening leader units with accessories found and earned in every chapter is also a fair method of empowering them throughout. However, I do have serious issues with the AI of summoned units. When summoning multiple units, they tend to congest the area around the Nightswan, which impedes the progress of any gatherers moving between it and a harvesting point. I also don’t like the ridiculous paths some units will automatically take if there are other units in the way. Too often, units will take absurdly long, inefficient routes that stray and, more often than not, alert enemies. It becomes a constant concern to make sure none of your units are straying into ridiculousness. I also took issue with combat units’ AI in their tendency to advance and initiate battles, especially when I just want them to hold a defensive position. Individual units will begin to stray and are quickly outmatched, causing unnecessary loss. Also, I often noticed that when there are enemies around and you want to pull back, the AI will override your orders. So, even if you select engaged units to return to the Nightswan or simply move to rotate in other units, the AI will quickly take over again, move in, and continue fighting until you end up losing that unit. The player’s commands should take priority, but instead the AI and its “fight to the death” programming will become an unnecessary complication to deal with. It becomes a constant distraction while you’re trying to handle other things elsewhere. Finally, the gameplay never evolves past this required gathering, summoning, and positioning for battle. The leaders and their abilities have insignificant influence on strategy and the game simply becomes a matter of trial and error to summon the correct units and optimally place them. This, in turn, makes the overall gameplay experience wear thin. Overall, the baseline mechanics are there and are implemented well, but vastly improved AI, more variety to gameplay, and more relevance for leader units would have immensely helped the effort. Since both story and gameplay saw ample changes to their styles, why wouldn’t the aesthetics be any different? 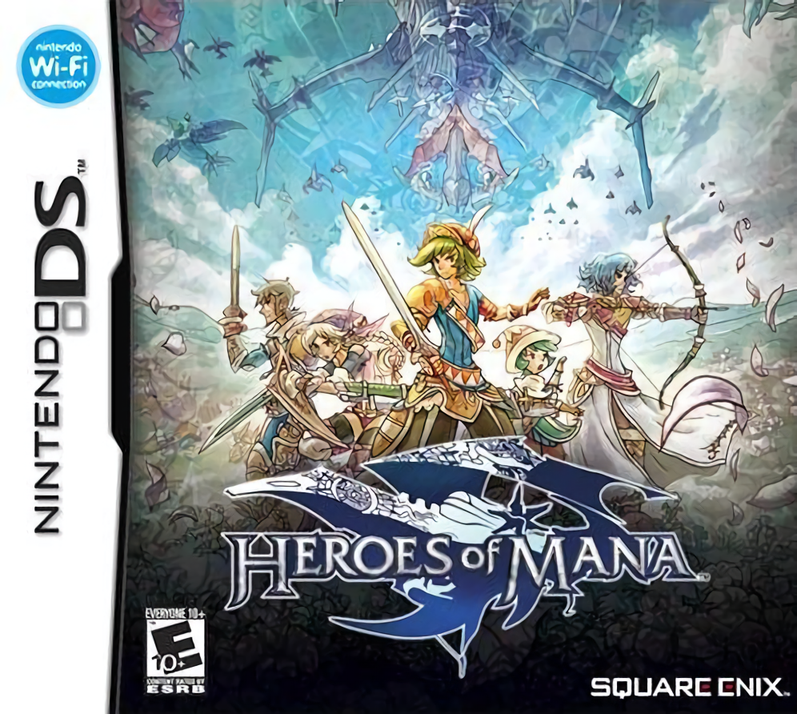 Heroes of Mana features a visual style that combines 2D artwork and 3D graphics. All of the cinematics, conversation portraits, and sprites are 2D and are traditionally depicted with the familiar art style of the series. The colorful, hand drawn style looks great and, as usual, fits perfectly with the fantasy setting. As for the short Benevodon summoning cutscenes and all of the level environments, these are rendered in 3D. While some of the 3D work is well suited to better show elevation and depth, or to demonstrate the size and vastness of ships and locales, it also tends to look bland. The texture work that comes with the 3D rendering is very plain and monotonous, which is only more noticeable with the contrastingly vivid 2D artistry. I see the necessity of polygonal work to shape the environment, with its barriers, walls, and varying terrain, but many of the textures and patterns are overused. Fortunately, this isn’t always the case, as many environments do capture the character of the locale or events within very well. However, I would have preferred more consistency. As for the audio, this game sounds like a Mana game. Yoko Shimomura, who had composed the score of Legend of Mana, produces an equally wonderful sound score here. The audio captures the personal struggles of the characters, the constant danger of the entire situation, and the sorrowful tones of a world terribly hurting. It also conveys the willingness of the nations to fight back and the intensity of battle in melodic form. The soundtrack manages to match the style and quality expected of a Mana game while also complimenting the new aspects employed in the game. And for a sound score to bridge that gap is astonishing, to say the least. Heroes of Mana is an attempt at something completely different for the series. While I applaud the ambitions of Ishii and his devs, their overall efforts are less than stellar. There are some fantastic moments to experience and the aesthetics are mostly strong, but with the issues in gameplay and the failures to adequately develop story and characters, this game is another example of awesome potential that’s never quite realized. Personally, I am left wanting so much more and very much hope Roget and crew’s story hasn’t concluded just yet. Drew has been an avid gamer most of his life, favoring single-player campaigns. For him, a worthwhile game is one that immerses you; it envelops you and draws out an array of emotions that produce those memorable moments we live for as gamers. View all posts by Drew D.